This chapter has illustrated the value of ultrasonography as a practical tool for studying and managing giant pandas. The technology is still vastly under-utilised, and its many advantages (noninvasiveness, reproducible real-time images, cross-sectional images of tissues/organs and the ability to measure morphometry) certainly argue for more widespread use. Applying ultrasound to the systematic examination of giant panda biology (especially in case-related investigations) will undoubtedly help find new solutions to physiological problems. It will also provoke the design of new and more specialised, species-specific instruments. Continued miniaturisation of transducer technology and the development of microprobes with compact, contoured shapes will improve the scanning of less accessible anatomical regions. Many new ultrasound systems offer colour-flow imaging that allows direct evaluation of blood-vessel architecture in reproductive organs. This is a promising area of research because the blood supply to the genital tract undergoes marked changes related to sexual maturation, gonadal activity and pregnancy. Three-dimensional ultrasonography will also further expand our ability to characterise reproductive soundness while facilitating a better understanding of complex physiological processes and creating near life-like images. A high priority should be to incorporate this technology into more comprehensive, integrated investigations involving other scientific disciplines such as endocrinology and behaviour. The information in this chapter is based on only a few individuals, so there is a need for a large-scale application to more giant pandas to fully understand the utility of ultrasonography for improving the management of the captive population. Given the importance of artificial insemination for achieving genetic management goals (see Chapters 20 and 21), ultrasonography will be critical for learning more about the time of ovulation with respect to hormonal cues to ensure appropriate timing of AI. It is also clear that more work is needed to identify a consistently reliable ovulation induction regimen in this species. Although noninvasive hormonal monitoring can be valuable in assessing ovarian responses after gonadotrophin therapy (see Chapter 8), ultrasound offers the added advantage of visualising the exact number of ovulation sites. This could be a critical tool for determining the number of ovulations that occur during a natural oestrus as compared to those induced by hormonal therapies. 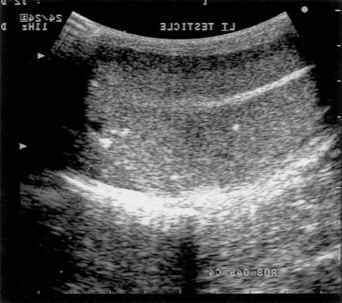 Ultrasound technology can be used to diagnose pregnancy in the giant panda as well as for monitoring foetal development. Finally, it could also be beneficial for addressing other unique health challenges of the species, for example, the unexplained but rather common observation of waves of ascites accumulation, and the aetiology of developmental abnormalities, such as Stunted Development Syndrome (see Chapter 4). There are undoubtedly more examples of how ultrasound technology could be combined with other reproductive technologies and behavioural assessments to answer questions that directly impact on the health and reproductive welfare of giant pandas. Given sufficient resources and access to these very special animals, there are no limitations to what can be learned. It is our hope that more researchers will accept the challenge of conducting integrated studies that cross disciplines not only to enhance scientific discovery but also to facilitate developing practical solutions for managing this endangered species.